Laura Miller eloquently at Salon.com writes on "Keepers of the Flame." As you might imagine, the idiosyncratic Plath Estate receives a little coverage exploring the posthumous life of Plath. Miller's commentary is never more brilliant when she points out the peculiar agenda of Plath's estate: "While most literary executors want to make their author seem a better — or at least a more decorous — person than he or she actually was, Plath was in the odd position of having the raw material of her posthumous reputation fall into the hands of a woman who preferred to make her look bad." In a wonderful blog post, Maeve over at theplathdiaries asks a very good question: "How do we read Sylvia Plath?" Hunt, Daniel, and Ronald Carter. "Seeing Through The Bell Jar: Investigating Linguistic Patterns of Psychological Disorder". Journal of Medical Humanities. 33:1. March 2012: 27-39. The "Introduction" by Harold Bloom notwithstanding, there is much to like about Kimberly Crowley's How to Write About Sylvia Plath. A book specifically built for library shelves and written for student readers, Crowley writes an accessible book which is easy to read and to follow, and which should help students jump start their ideas in writing about Sylvia Plath's prose and poetry. The book begins with a long chapter called "How to Write a Good Essay" which culminates in the printing of what should pass for a good essay and is followed by "How to Write About Sylvia Plath." It is not the cleanest written text, and what I mean by that is there are instances throughout where bad information is conveyed. For example, Plath did not die on 10 February 1963, as page 51 would have you believe. The section "Her Influences" is completely misguided. Rather than looking at those writers from whom Plath learned (Stevens, Eliot, Lawrence, Hughes, Yeats, etc. ), Crowley focuses on those writers whom Plath influenced (such as Catherine Bowman) and how Plath has infiltrated popular culture. It is only about three pages, but it is a miserable experience. Crowley often applies the title of biographer to a number of critics she quotes. These scholars, Lynda K. Bundtzen, Kathleen Connors, Pamela Annas, and Jacqueline Rose are not biographers of Plath, and in general assigning them as such is careless. The niggling errors are scattered throughout the book, and to experienced readers of Plath, it begins to get under the skin as students will look to this work for guidance in the essays they write. As an editor of Plath Profiles - which loves to publish student papers - I shudder to think that on the one hand the book is filled with lovely ideas to help students who may be on their first Plathian journey, but on the other had may be the first resource they encounter and may start them off with bad habits (bad information). Crowley examines just one story, "Johnny Panic and the Bible of Dream," six poems "The Colossus," "The Moon and the Yew Tree," "Ariel," "Daddy," "Lady Lazarus," and "Three Women;" as well as Plath's lone published novel, The Bell Jar. Each work discussed contains the following headings "Reading to Write" and "Topics and Strategies." The "Topics and Strategies" has sub-headings that look at "Themes," "Characters," "History and Context," Philosophy and Ideas," "Form and Genre," "Language, Symbols, and Imagery," and "Compare and Contrast Essays." Each section offers ample examples of Plath's writing, a discussion about the work, and a section of questions and topical ideas to lead students directly into the work discussed, additional Plath works, and other works, too. After each work discussed there is a list of bibliographic sources. This is fine, but the book lacks a complete bibliography at the end which makes it very difficult to track down the sources referenced. A full bibliography is very much missed and counts against the book and the series. Publishers have a responsibility that is often ignored to publish good quality, factually accurate information. There is a lot of bad information out there, but there is also good, accurate information too. And there are people out there, myself included, that care enough about Plath that they get frustrated when this bad information is disseminated as authoritative. So, publishers and editors: get an literature expert or a Plath scholar to read these books in the editing/proofing process to correct this persistent issue. I will not get into every single instance where the book fails to impress, but when Crowley asserts in the section of "Lady Lazarus" that both this poem and "Daddy" are villanelles, I laugh and draw the line. Crowley writes, "Although this poem does not follow the [villanelle] pattern completely, Plath's poetry is considered by many to be a contemporary form of the villanelle" (181-182). Crowley sites this page from poets.org in which Plath is listed as a writer the villanelle and asks, "How has Plath updated the villanelle for a twentieth-century audience" (182)? She then quotes a passage from Plath's Journals (8 March 1956) in which Plath writes "I rail and rage against the taking of my father, whom I have never known; even in my mind, his heart, his face...My villanelle was to my father; and the best one" (page 230). This is most likely "Lament: A Villanelle" which begins, "The sting of bees took away my father / who walked in a swarming shroud of wings / and scorned the tick of the falling weather." However, instead of sorting out which poem Plath was referring to, Crowley hits 88 mph which activates her flux capacitor (at a charge, a very large charge of 1.21 gigawatts) and leaps to the future asking, "How does Plath's use of the form in 'Daddy' compare with her use of it in 'Lady Lazarus'" (182)? No. Just no. The only reasons I can think of to make the erroneous connection that "Lady Lazarus" and "Daddy" were villanelles are: A. Laziness/unfamiliarity with the subject and B. That by clicking the link to Plath's name on that Poetic Form: Villanelle page on poets.org you eventually can read "Daddy" and "Lady Lazarus" on that website. However, that is no excuse, and the possible ways of thinking of them as villanelles and linking a 1956 journal entry about a 1955 poem to poems written in 1962 are mysterious. "Lament" was published in October 1955 in the New Orleans Poetry Journal. You can see the cover of this issue here. On 11 February 2012, luxbooks (Weisbaden, Germany) started the campaign: Help Us Free Sylvia Plath. luxbooks is a small German Independent Publisher focusing on American poetry in bilingual editions. 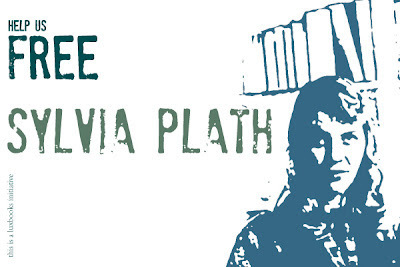 The campaign to "Free Sylvia Plath" involves the German language rights for Sylvia Plath's still untranslated debut poetry collection The Colossus. For decades, the rights have been blocked by an option held by a bigger publishing house based in Berlin. However, they have not exercised their option will not allow for any other publishing house to publish the book. luxbooks is quite small and cannot compete with bigger publishing houses. So they decided to start a crowd-funding project on indiegogo to raise the funds necessary to make a competitive offer to unblock and buy the German language rights from the original publishing house. More about the planned edition, the possibility to donate, more info about the campaign and many links to the campaign's twitter-, facebook- and youtube-accounts can be found at the link above. Bahmer, F.A. 2012. "Charles Bukowski and Sylvia Plath on Moles and Melanoma." Archives of Dematology. Vol. 148, no. 1: 108. Raza, Raihan. The Poetic Art of Sylvia Plath: A Critical Study of Themes and Techniques. New Delhi: Sarup Book Publishers, 2012. A "love letter" in the form of a poem by Ted Hughes to Sylvia Plath is included in Andrea Clarke's recent book Love Letters: 2000 Years of Romance (British Library, 2011). This might be another one of those Birthday Letters outtakes such as "Last Letter". The poem begins "Cambridge was our courtship." If anyone has access to this, I'd love to read the poem. Recently John Mullan wrote about "10 of the best" treatments of insomnia over at The Guardian. He includes Plath's poem "Insomniac." Indulge. The word is bulbous. It describes perfectly buying Sylvia Plath's "Horse Chestnut." 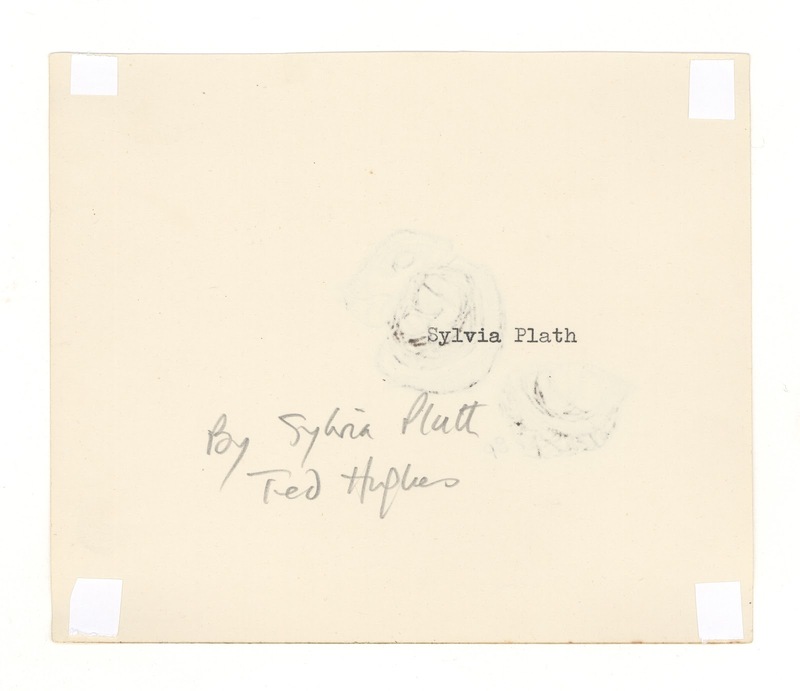 When I learned that the items comprising the exhibit "Sylvia Plath: Her Drawings" were for sale I nearly passed out. It was the opening day of the exhibit, and I was browsing the Mayor Gallery's website hopeful that the images with which we were teased in the press would all be available for viewing. In all the news stories leading up to the opening, I cannot recall one mentioning that the drawings were for sale. The day the exhibit opened there were, indeed, images on the Mayor's website. I clicked the first image, the one of "Wuthering Heights Today." The image -- which I am familiar with as it was reprinted a few times: on the cover of the 1965 Uncollected Poems and in Lois Ames' "Biographical Note" in the American edition of The Bell Jar -- appeared on the web page but what struck me was the not the beautiful digital surrogate of the drawing but bold "Sold" in red on the left-hand side. I clicked back and then viewed the image for "Cambridge: a View of Gables and Chimney-pots." The same red "Sold" taunted me; distracting me from what I was there to do which was to view the images. My mind stopped. I clicked over to the contact us link and was on the phone with the Gallery before I knew what I was doing. Within a minute I had the price list of the remaining drawings that were unsold. 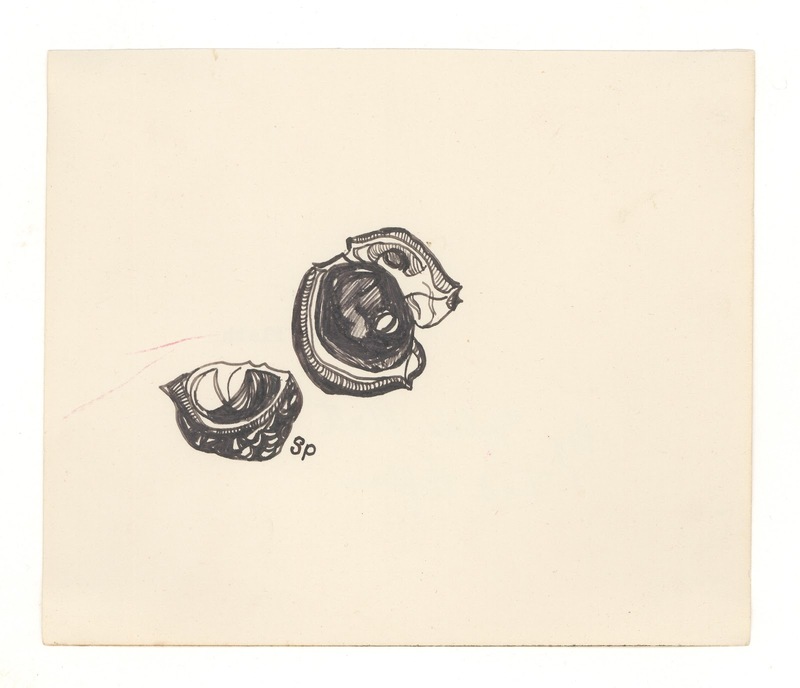 Within a few more minutes I agreed to purchase "Horse Chestnut," which was the last drawing for sale with Plath's initials gracing the paper. It would be shipped the week of December 12th, but the nearly six weeks in-between were interminable. That is, until the gallery emailed me the tracking number for the shipment. Two days later - after a brief customs delay - the drawing was delivered. Opening the box at work and unwrapping the layers of bubble wrap and packing tape felt like it took ages. 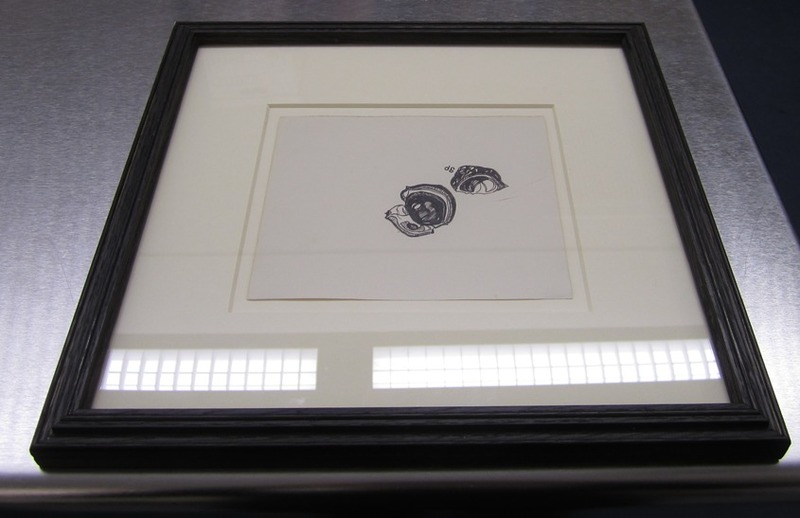 The drawing came in the frame in which it was exhibited. Taped to the back was a photocopy of the back of the drawing, which had Plath's name typed, presumably by Plath herself. In addition, a note by Ted Hughes which reads "by Sylvia Plath" and was accompanied by his authenticating signature. After seeing that, and learning from the gallery that the drawing was not in UV protected glass (which means it could possibly fade over time if exposed to too much light), I decided immediately to remove the drawing from the frame. It was an ordeal to remove the picture from the frame. It was sealed tight which, from time to time, made me question the decision to remove it. 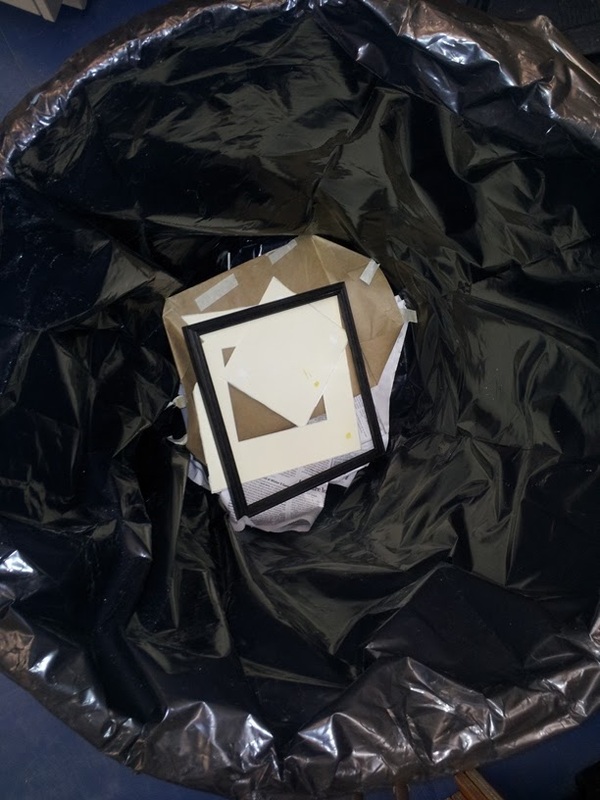 But, after breaking the paper which covered the seams between the frame and the backboard; and after removing the points that went into the frame that kept the backboard down; and after carefully cutting the gummed linen tape that bound the glass to the larger mat board; and after slicing the tape connecting the smaller, island mat board from the larger one; and after ever so carefully slicing through the four adhesive paper hinges connecting the smaller mounting mat board to the drawing itself was I able to hold the most precious piece of paper I have ever owned. From an aesthetic point of view, I am frustrated that the drawing was adhered in this way: with an actual adhesive substance. It can be undone -- in fact it was undone, by applying methyl cellulose to soften the adhesive on the hinges and then gently pulling up the tape (another option was to steam them off) -- but I don't know why they opted for this rather than, for example mylar photo mounting corners that you can tuck the corners of the paper into to hold it in place. These corners do the same thing: they hold the paper in place, but even better they don't physically attach to the drawing! And, being clear they do not affect viewing the drawing, and do not damage it! It seems to me -- not knowing anything about this artsy framing world -- that by adhering something to Plath's drawing you are actually somehow damaging it. I understand the materials the framers used were supposed to archivally sound, but I just did not like the idea of something sticking to it... You could see the impression of the adhesive through the drawing,and the corners were actually curling in a bit, like there was too much tension in the way the image was mounted. 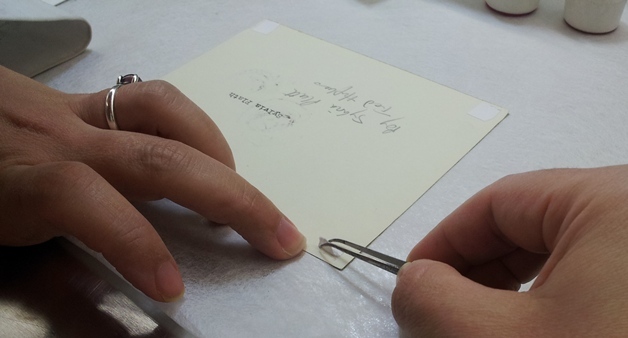 This was corrected by gently pressing and flattening the paper under a weight for about a week. 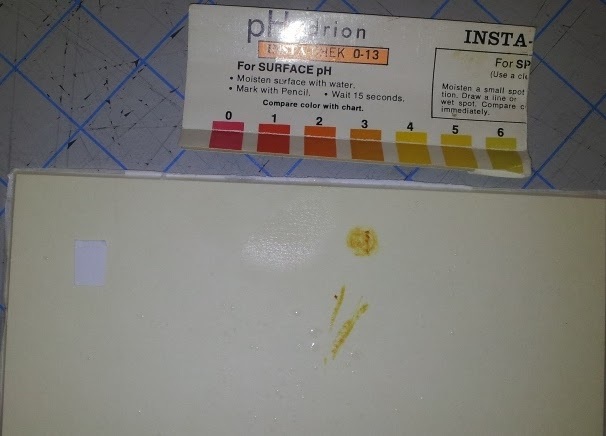 And lastly, the mat board and the mount board the framers used tested positive for acidity. If you are reading this, and you purchased one (or more), you may want to consider starting from scratch and re-doing it. As a result of all this...the frame and mat boards were tossed. 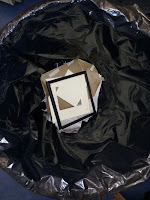 All that being said, once I was able to hold the drawing in my hands, the object became more real than before. I felt selfish. I feel selfish. It belongs in an archive and one day will. (Actually, it's at work so it kind of is already in an archive!) And now that the drawings are separated by an unknowable number of miles, a line from Plath's poem "The Colossus" seems especially apt: "I shall never get you put together entirely." If you are reading this and were lucky enough to see the exhibit in person, please know that I am very jealous. 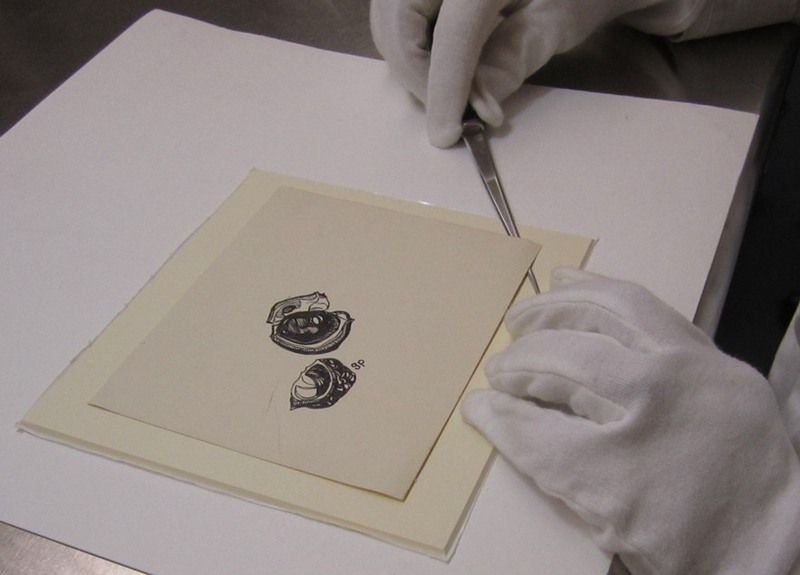 The authentication by Hughes was in pencil, which was probably done as pen might have bled through the paper. And who typed Plath's name on it? It "looks" like her own typewriter. The "Sylvia" is typed behind the larger chestnut and the "Plath" off it just above the smaller nut. 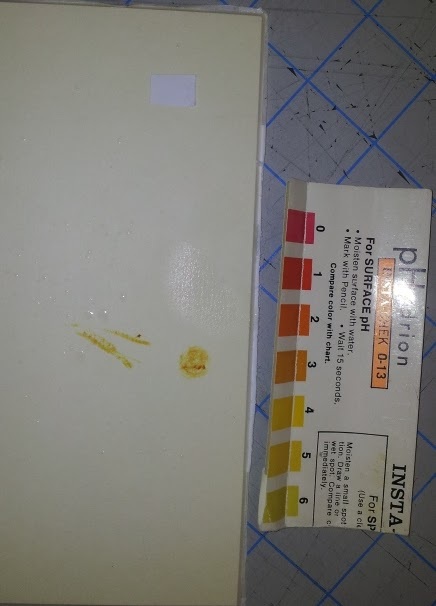 What about about the two small red pencil marks? Did either of her children - Frieda or Nicholas - make them? Did Plath herself when she was grading a paper? Was it a red-painted nail? I don't know! But while they seem like a blemish and are likely the reason it remained unsold after the preview evening which opened the exhibition, they are, to me, anything but. After gazing at "Horse Chestnut," and the other drawings from the exhibit in the catalog, I came to the conclusion that the presence of Plath's initials on the drawing means that it was something she considered completed. For me, this makes the piece more special and precious. And for those drawings in the exhibition that look nearly complete or that are unfinished: what happened in Plath's life at the time of composition to distract her from completing the drawing? I suppose we will never know. Plath describes her sketchbook briefly in her Journals. In the entry written from Benidorm on her honeymoon she writes about "Mr. and Mrs. Ted Hughes' Writing Table": "...a bottle of jet black ink, scrupulously screwed shut, a small sketch book of rag paper atop Ted's anthology of Spanish poems..." (259). For other sketching references in Plath's Journals see pages 249, 554, 555, 558, 559, and 560. On page 558, Plath possibly describes this drawing when she writes "Sat once more in Tuileries to finish sketch." On page 559-560, Plath possibly describes this drawing, "Stopped by Seine in sun to sketch a harlequin-style kiosque which had taken my fancy near the Louvre: one of those round poster-stands in green with a mosque-like roof and colored pastel posters all around...I was turning back to finish my little sketch of which I was fonder than any I'd done..." And, on page 560, possibly this drawing, "...walked to Ile de la Citie and sat on a bench before the Palais de la Justice … in gray chill air sketching the Tabac and cafe opposite...heavy and structured in simple shaded geometric forms and designs..."
I scanned "Horse Chestnut," both sides, and you can see here the remaining bits of paper from the adhesive that used to "suspend" the drawing in mount in the frame. These have been removed and I did take a clean scan before having a custom frame made, and housing it on a mat board that is actually acid free, and within UV safe glass. There is a large charge. But it was a very small price to pay for a one of a kind document created -- with all her heart, thought, creativity, and concentration -- by Sylvia Plath. If you have not already, please check out Plathery's recent post about "Still Life with Pots and Fruit." Today is the 49th anniversary of Sylvia Plath's death. The above was more about me than I am comfortable with, especially in a blog about Sylvia Plath, so I thought I would put down a selection of some of Sylvia Plath's beliefs from her Journals. "someone believes I am a human being, not merely a name"
"I don't believe in God as a kind of father in the sky. I don't believe that the meek will inherit the earth." "I believe I have kissed him once. Perhaps twice." "I accept the idea of a creative marriage now as I never did before; I believe I could paint, write, and keep a home and husband." "Believe in some beneficent force beyond your own limited self"
"Percy Key is dead...I find this difficult to believe." In her poetry, Plath used the word "believe" only ten times. Most memorably, perhaps, is from from the incomparable "The Moon and the Yew Tree" : "How I would like to believe in tenderness." Sources (Beyond The Perf, Stamp News Now) seem to indicate that the Twentieth-Century Poets stamps set, which includes Sylvia Plath and Theodore Roethke among others, will be released on 21 April 2012. The other poets recognized, as Forever Stamps, are Elizabeth Bishop, Joseph Brodsky, Gwendolyn Brooks, E. E. Cummings, Robert Hayden, Denise Levertov, Wallace Stevens and William Carlos Williams. Carl Rollyson, who is working on a new biography of Sylvia Plath, has recently published a "London Diary" over on BiblioBuffet. In this piece, he discusses a bit about researching Sylvia Plath in the British Library and in person with two of Sylvia Plath's friends, A. Alvarez and Elizabeth Sigmund. Certainly gives a brilliant teaser when he writes: "I imagine Sylvia found it restful to be in Alvarez's company. He was such a receptive listener and an astute critic. I can't tell the whole story here, but by the end of my three hours with him, he was reading to me from his diary, which recounted a shocking event that will have its place in the last chapter of my Plath biography." The Department of English at Indiana University is accepting papers for the "Sylvia Plath Symposium 2012: The October Poems" to be held Thursday to Sunday, October 24-27 at the Bloomington campus. This event commemorates the 50-year anniversary of Ariel with a focus on poems Plath wrote in October 1962. While all topics related to Plath's work may be submitted, featured scholars and artists will highlight Plath's most famous works. The opening day seminar will address the phenomenon of inspiration and the creative imagination. Literary panels will take place on Friday and Saturday. A website posted in May will provide more details. Deadline for abstract submissions is July 1, but earlier is recommended, particularly for international scholars. Students are encouraged to submit. Please submit 250-300 word abstracts for 15-20 minute papers to plath70 (at) indiana.edu. Queries may be sent to kdconnor (at) indiana.edu. This week it is worth calling your attention to "Seeking Sylvia in the Rare Book Room" by Adrianne Kalfopoulou, in the Winter 2012, #18 issue of Del Sol Review. You may remember that last October we learned of Adrianne's essay "Sylvia Plath's Emersonian I/Eye" which appeared in Women's Studies. 40:7. October 2011: 890-909. At the risk of being a spoiler... you can look forward to a reading a highly original, clever, and enviable poem of Adrianne's in Plath Profiles 5, which will be published this summer. 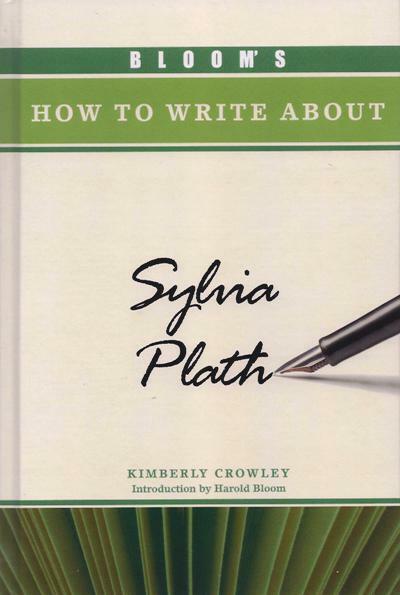 Very recently published is Kimberly Crowley's Bloom's How to Write About Sylvia Plath published by Chelsea House (Publisher, Amazon). This is part of Harold Bloom's series How to Write About [your name here]. I hope to review this later in February or perhaps, early March.